Having recently returned from the Philippines, planning our 2013 High Five Hope events in Davao, Cebu, and Manila, I was reflecting on a great book I read during my travels, How Children Succeed: Grit, Curiosity and the Hidden Power of Character. The research and lessons in this book directly relate to our mission at High Five Hope. The book challenges the perceptions about what really matters in child development. The author, Paul Tough, contends that the qualities that matter most for children and success have more to do with character: abilities like perseverance, curiosity, conscientiousness, self-discipline and optimism. I think this speaks to the very core of our mission to serve kids in need – this is all about hope. Kids know they can get better, they know they can improve their lives, and what we do with High Five Hope is to create the opportunity for kids to practice this. It is reassuring frankly, to read an acclaimed and recognized book, with sound research, that supports our design intent behind High Five Hope. But it’s also important to recognize that it’s the collective effort of what we do — from the program, to the volunteers, to the partners, to the coaches — that allows us to make a positive impact. This is an important point and the role of the coach is crucial, particularly in our program since our coaches are not only there to instruct and teach about a given sport, but to encourage, connect, affirm, empathize and inspire the H5H kids with the right values. This Fall I will be re-writing our ‘Coaches Training Kit’ for High Five Hope, taking the learnings of our past five years and incorporating these lessons and experience into how to use every practice, every game, every opportunity we have with the H5H kids to deliver the core values of our program. Which in turn will help the kids to build the right habits, a strong character and a solid foundation of hope, to boost their lives in a positive direction. 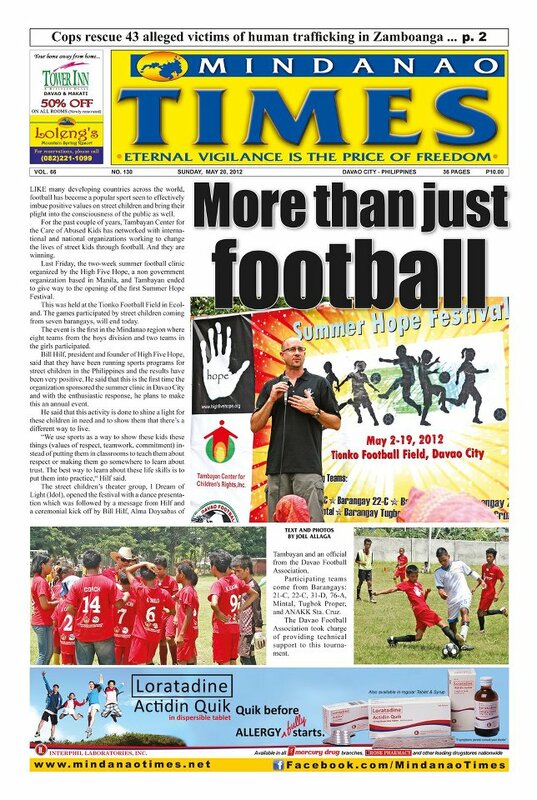 At our H5H Summer Hope Festival in Davao this year, I thought the headline of the Mindanao Times article on the right (we were the front page story!) captures this perfectly. 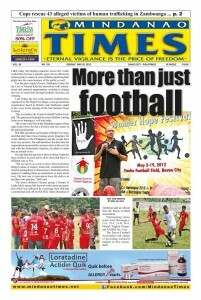 It’s more – much more – than just sports. Here’s to grit, to curiosity, to character and to the incredible potential for children to grow, to change and to leave their mark on the world.